here in Portland, I saw and was smitten with this tree. 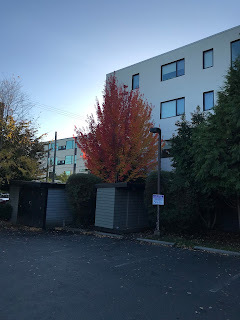 Standing at the edge of a parking lot, resplendent in shades of yellow and red, the tree summed up perfectly the slight chill in the fall air and the sense that though winter was indeed coming, it was far from here yet. I don't spend enough time noticing the magic on display all around us all the time, but every now and then I get lucky.